Chocolate Banana Fig Bread – simply sweet and wholesomely indulgent. 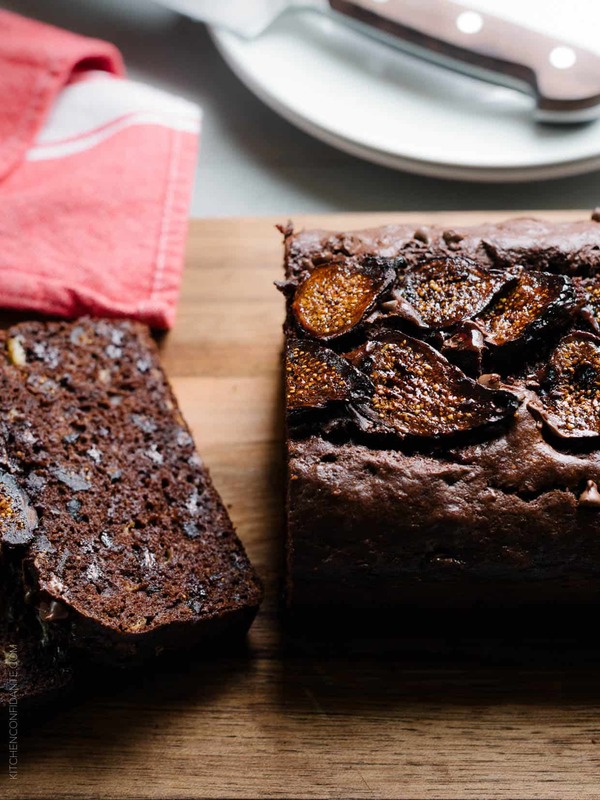 Dried figs lend its natural sweetness to this dark and decadent quick bread! 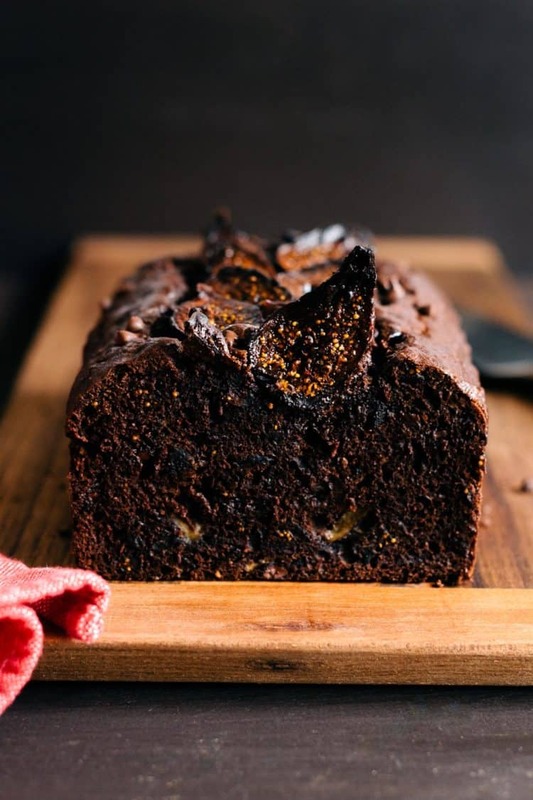 Note: I originally shared this Chocolate Banana Fig Bread on April 10, 2016; it was not sponsored at the original time of publication. However, it has been updated on December 14, 2018 with a sponsored video I created in partnership with Valley Fig Growers. This post was updated in partnership with Valley Fig Growers. With the return of rain came an insatiable urge to stay indoors and bake. That, coupled with the fact that I was recovering from back to back trips in just this week alone, and all I wanted to do was spend the morning feeling the dust of flour on my hands. I wanted to crack eggs into a bowl and whisk them until the yolks disappeared into a frothy light yellow. No need for the electric mixer. This was about spending the morning quietly, with just my whisk and a spatula, and a sharp knife. I had set aside a few ripe bananas – hid them, practically – since even the speckled brown ones never last long enough in our house. They are usually smoothie-bound, but the buttermilk banana bread craving was calling. I didn’t have quite enough to do my usual double batch, but I did bring back from LA some beautiful dried black mission figs. Between you and me, fresh figs are always my preference and my true love. I rarely dabble with dried, simply because I would often rather wait for the abbreviated fig season to get my fill. 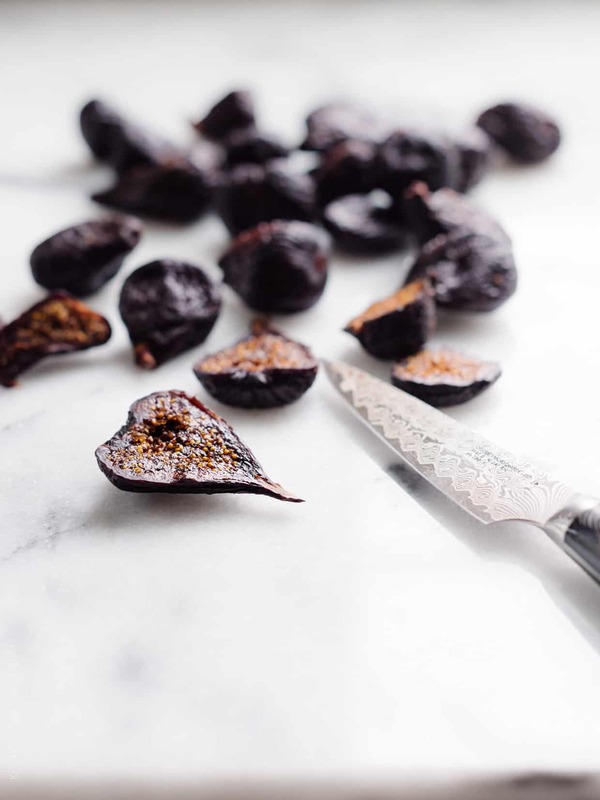 But since we are several months away, and because I did happen to encounter dried California figs at my conference, I started dreaming up all things fig and chocolate. One thing I do love about using dried figs is how it brings its natural sweetness. 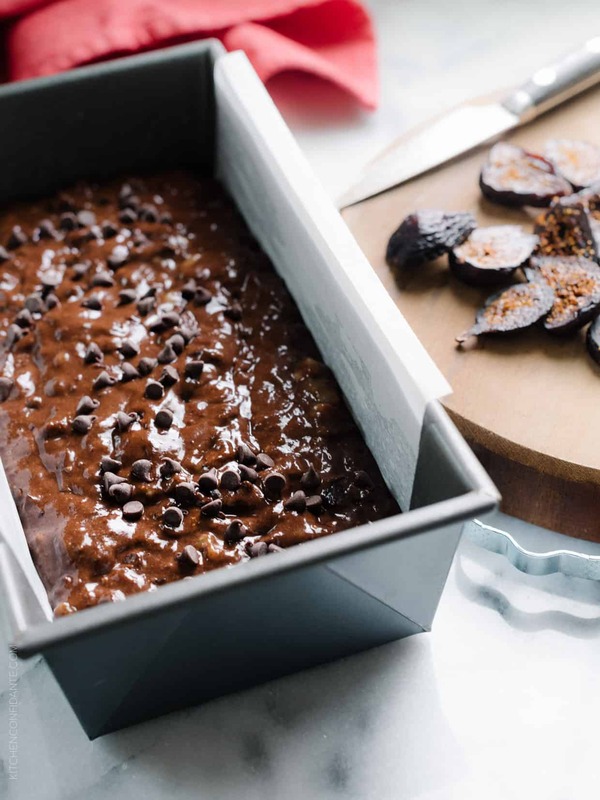 Harness that goodness in this Chocolate Banana Fig Bread for a treat that is rich and inviting. A warm slice out of the oven is all you need with a cup of tea on a rainy weekend, or if you’re like my family, with a scoop of vanilla-flecked ice cream. The loaf disappeared a little too quickly here, but the rain is holding on. Time to get my hands dusty again. 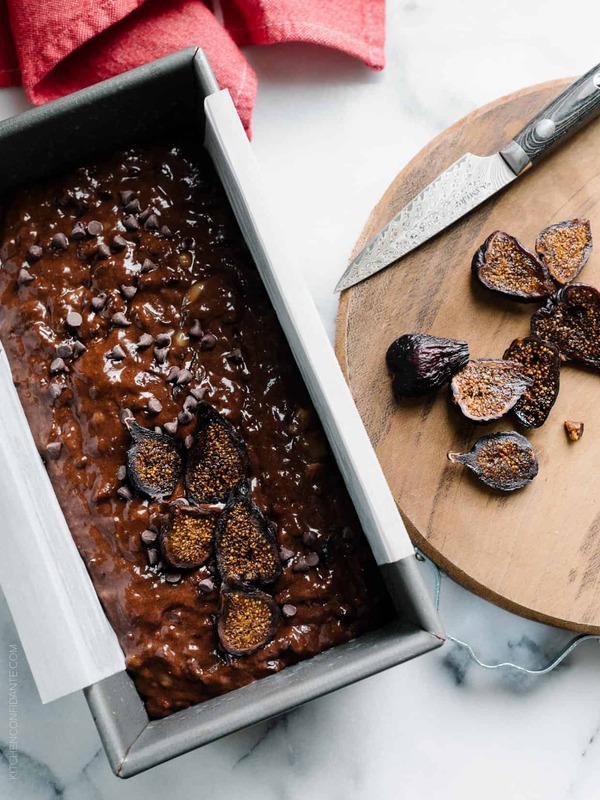 Be sure to check out Valley Fig Growers to find more fig recipe inspiration! Disclosure: This post was updated in partnership with Valley Fig Growers. Thank you for supporting brands that matter to me; sponsored posts such as this help behind the scenes at Kitchen Confidante. All opinions in this post are, as always, my own. Preheat oven to 350°F. Grease a loaf pan, line it with parchment paper, and set aside. In a medium bowl, mix banana, figs, sugar, eggs, oil and vanilla. 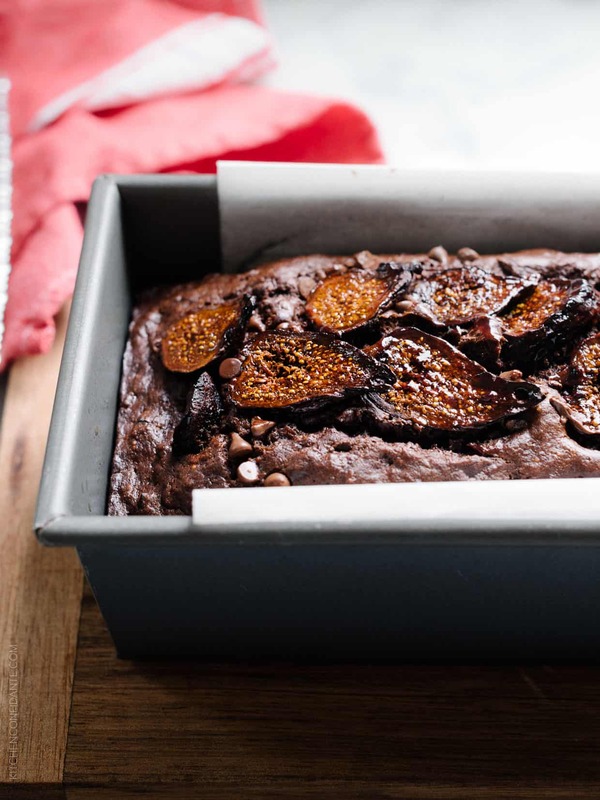 Take halved figs and soak them in a bowl of hot water to plump them up a bit and prevent burning in the oven. In a separate large bowl, whisk together the flour, cocoa powder, salt, baking soda, and baking powder. Add the banana-fig mixture and mix until just combined. Stir in the chocolate chips. Pour the batter into the prepared loaf pan. Drain and arrange the halved figs on top and nestle into the batter. Bake for 45-50 minutes, or until a toothpick inserted in the center comes out clean. Let the bread cool in the pan for five minutes, then transfer to a wire rack to cool. Cut with a serrated knife. Serve warm or at room temperature. Omg Liren! This banana bread is gorgeous! 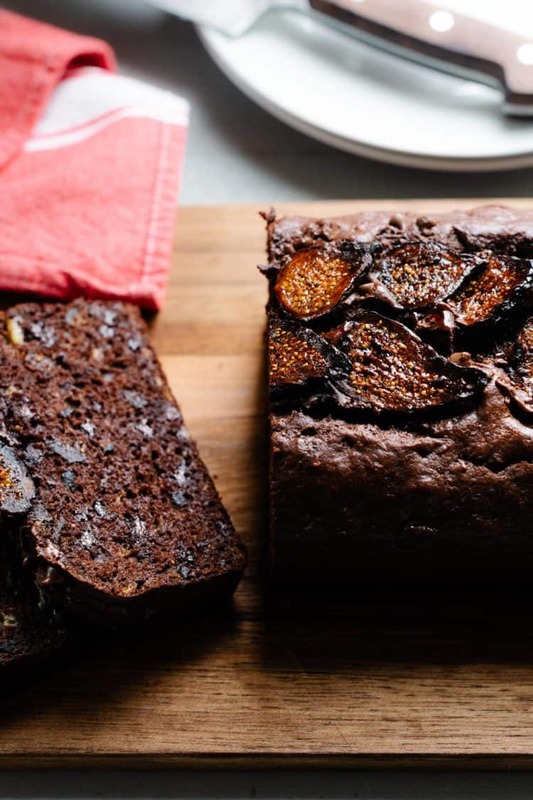 I’ve never even thought about putting figs with banana bread, and with chocolate too no less! It sounds delish and I so wanna devour a whole loaf right now! I often forget about figs–probably because they’re like a foreign ingredient to me. So not only a reminder but a surprise to pair them with chocolate in two forms. Gorgeous, too! This looks wonderful! How would you suggest to do this with fresh figs? Thanks, Peyton! 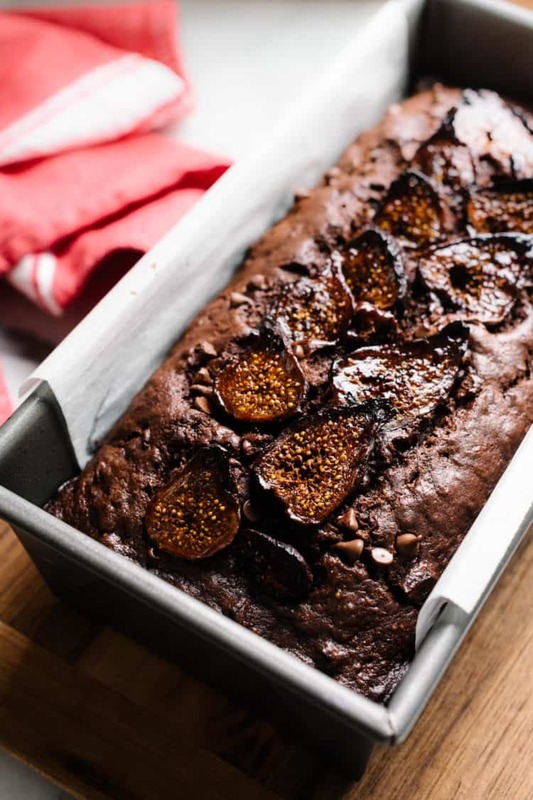 You can easily use fresh figs here, and if you wish, you might consider adding a little more sugar to sweeten the recipe since dried figs seem to have a more concentrated sweetness to it. Please let me know if you try it with the fresh figs and how it turns out! I tried this with fresh figs today- worked perfectly. I also did half the oil and the other half full fat greek yoghurt and it was moist and delightful and a little bit easier to rationalise eating more than one slice! Thanks for the recipe! So awesome, Vanessa, I’m so glad it turned out well! It’s hard to resist eating an extra slice! So glad to find you and your work of art !